There is a prominent pastoral concern in this discussion as well. As one progresses in the Christian life, rather than seeing victory over sin, one often struggles with the fact that the sins which should be done away with keep returning. The old Adam continually reasserts himself, bringing God's children back into the sin which previously enslaved them. If I as a pastor were to emphasize the work of sanctification and progress in the Christian life, one's state of mind would likely become that of despair. The progress that we hope to find in our spiritual journeys simply isn't there. Rather than pointing to that work of God which is still incomplete, that work by which God would still only be able to call his people “ungodly”, I as a pastor have a duty to point to that work of God which is complete, that work by which alone one will be received into God's kingdom and participate in the resurrection unto life. Alien righteousness is full and complete, and is the only thing which one can cling to in assurance that eternal life is a present possession, not the incomplete work of renewal which will only lead to the Christian's realization of their failure to progress as far as they should. Paul demonstrates this principle in a pastoral manner in the first epistle to the Corinthians. Of all his letters, this is the one in which Paul deals with the broadest moral problems. The Corinthian congregation is struggling with sectarianism, sexual immorality, a lack of concern for the sins of others, and a tendency to take other Christians to court. 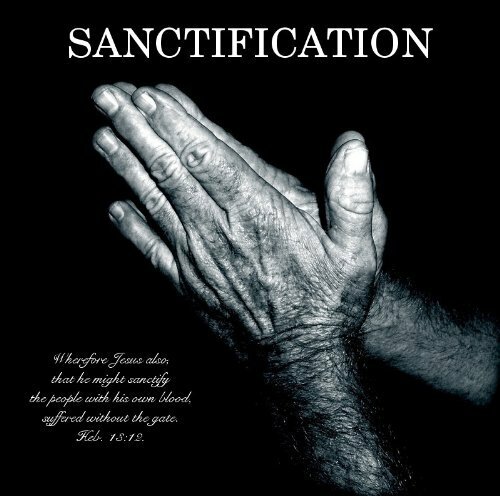 Amidst this group of people, seemingly lacking the fruits of sanctification, Paul is willing to address them as “saints.” Even though they are full of obvious sin that Paul addresses throughout this epistle, they are righteous and holy people. After chastising the Corinthians for their tendency to desire taking others to a law court in order to settle church disputes, Paul warns them that those who practice wickedness will not inherit the kingdom of God. Rather than pointing them, then, to the sinfulness of their own lives, and the lack of fruit that they demonstrate, he reminds them of something which is a past reality. He states, “And such were some of you. But you were washed, you were sanctified, you were justified in the name of the Lord Jesus Christ and by the Spirit of our God.” He reminds the Corinthians that even though they demonstrate all sorts of sin and wickedness within their congregation, these sins do not define who they are in Christ. Though previously slaves to sin, the Corinthians have now been baptized into Christ, they have been set apart, they have been declared righteous and their sins have been forgiven. Even in the midst of a situation of profound sin, Paul is willing to assure the Corinthian believers of their status before God by their baptisms and their justification. I can't wait to read this book. I really hope that it will open up some actual discussion between Lutherans and Calvinists. I don't think most Reformed people are aware that we exist. They just claim that Luther guy as one of their own, Even the more careful Reformed theologians, like Horton, just sort of brush off our theology without giving it serious attention, as he did in his recent systematic theology. I hope so too Nick. The lack of dialogue between the two sides is why I found writing this book so necessary. A very good chapter, Jordan, and a very enjoyable read, especially in light of the accusation thrown at Lutherans (and Reformed to a lesser extent) that there is little or no emphasis on sanctification in Lutheranism. I'm looking forward to this book! Between your book and Jonathan Fisk's book, I've got some good Lutheran material to become immersed in! The fact that justification is a completed process is especially comforting to me. I see many times when I slip into anger and other obvious sins and have a tendency to despair. I need continually reminding that "it is finished". That gives me the grace I need to get up, repent and move forward in the power of the Holy Spirit. I find your writing helpful to my spiritual walk and as you and your wife bring them to life in your own personal lifestyle, it encourages a downcast such as myself. So thank you. God has blessed us with ones so young, loving and wise. In fairness some confessional Lutherans aren't particularly in using the Reformed as anything more than a punching bag. Paul McCain comes to mind and I can't remember the young Lutheran minister on Issues Etc who thought it would be a chuckle to refer to the Reformed as "the deformed." Both sides have a lot of room for improvement. David that is the unfortunate truth. It saddens me to see people act like that toward each other but both sides seem to do it pretty frequently. Jordan, I am trying to understand your point about Abraham in Genesis 12. Are you saying Abraham was unjustified until Genesis 15? If so, then it seems like this runs into the twofold problem of (a) forcing Abraham into some sort of pelagian framework since he's doing good works from Ch12-14 and yet unjustified the whole time, and (b) going against the testimony of the text which indicates Abraham had saving faith as early as Genesis 12. For example, in Genesis 13:4 (and 12:8) it says Abraham “called upon the name of the Lord”. Yet in Romans 10:13 it says: “whosoever shall call upon the name of the Lord shall be saved.” Thus, it’s impossible that Abraham was not saved if he called upon the name of the Lord prior to Genesis 15. Nick, the confusion is probably because this comes after a fuller explanation of this in the previous chapter. My point is that justification is not just a one time event in the beginning of the life of faith, but is a continual declaration of one's standing before God through faith. Thus even though Abraham was justified in chapter 12, he can be said to also be justified in chapter 15. I guess I would have to see the previous chapter, because I don't see how Justification can be a 'continual declaration'. Unless what you're describing is akin to the Vindication reading of James 2:21-24, meaning just as Abraham was vindicated by works in Gen 22, he was also vindicated by faith in Gen 15. But in that case it's not so much of a 'continual declaration' as it is a (re)affirming that one was already declared righteous once-and-for-all upon conversion.